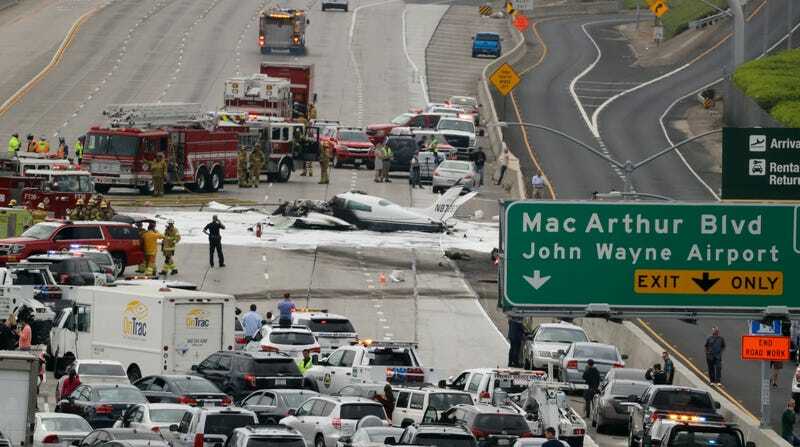 A small plane carrying two passengers has crashed onto the busy 405 freeway by Irvine, CA earlier today, severely injuring the two passengers of the plane and shutting down southbound traffic on the freeway. The LA Times reports the plane, a Cessna 310, crashed short of the John Wayne Airport runway, clipping a car as it crashed into the freeway and burst into flames. The passengers in the plane have been taken to the hospital, according to news reports. As you’d imagine, there’s been all kinds of video of the plane crash and the subsequent wreckage posted to social media. Many of the videos show multiple cars on fire and the chaos caused by the crash. Southbound lanes on the 405 still seem to be closed as cleanup efforts continue to clear the wreckage. It’s incredible more people were not injured or killed, really.